Mother-of-three Sonya Kedwell pegged her washing out in the early morning sunshine and went inside her kitchen to check on her toddler daughter. Seconds later she heard a thunderous crashing sound and looked round to see a pile of rubble just feet away from where she had been standing. 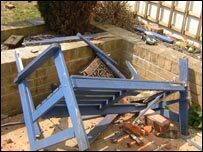 The chimney of the terraced house had toppled on to the toy-strewn patio, smashing a garden bench to pieces. It was sheer luck that 18-month-old Amy Lee had not been playing there. Her two sons, Thomas, eight, and Jacob, 10, were away staying the night with their father. "It would have been terrible if they had been in the way," she said. Next door in Pavilion Road, Folkestone, her neighbour Nichola Hawley's chimney landed in the road. Later, as the shock subsided, the women stood on their doorsteps discussing their experiences. "The children were upstairs watching TV when everything started shaking about and things were falling off the walls," said Ms Hawley. 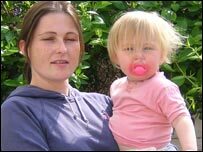 Her children - nine-year-old Amy, seven-year-old Connor and three-year-old Charlotte - were shocked but otherwise unhurt. She said everyone immediately went out into the street to find out what had happened - and they were still there several hours later trying to take it all in. Chimney pots, bricks and other rubble lay strewn across the road. Residents were told it was safer to walk in the middle of the street where any falling masonry was unlikely to hit them. Many picked their way up the street to watch a firefighter being raised above the chimneys on a turntable ladder to inspect damage. It was a scene repeated all along Pavilion Road, Canterbury Road and Black Bull Road. 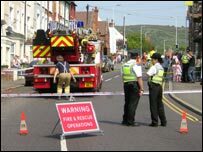 Police and fire service tape kept spectators away from danger but many were keen to take in all the activity. Alan Martin said his house had a crack in the ceiling but he was much more worried about his brother, John, whose house in nearby Black Bull Road was uninhabitable. "He's not allowed back in - there's a hole in the roof and his front room is as black as the ace of spades," he told neighbour Paul Chandler. Mr Chandler joked that a vase had fallen down and hit him on the head during the tremor. But he was also worried about people evacuated from their homes and said several people had taken children's clothing up the road to the Salvation Army HQ where they were being cared for. Salvation Army spokesman Peter West said between 80 and 100 people had taken refuge in the Canterbury Road centre. 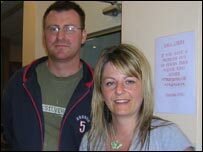 "I'm an ex-copper and I've dealt with some fairly huge incidents - floods and fires," he said. "These people's reaction was what you would expect from anyone who has had an experience they've never had before. "They weren't traumatised but they were confused and shaky, as they always are when they don't know what has happened or what is going to happen next." Amanda Langford, who said she was very shaken up, was taken to the Salvation Army after next door's chimney fell through her roof in Gladstone Road - leaving a gaping hole. "I was in the attic bedroom - there's rubble everywhere," she said. She was going to stay with family member Jason Hurd in Dover, except he didn't know the state of his own house. "I haven't been back yet - I was up here plastering at her mother's house," he joked. "My wife was out as well - I don't know if the house is still standing." Tea and sympathy were being handed out by the Salvation Army workers and nurses were on standby if anyone needed medical help. As those who had found places to stay overnight drifted outside the calm and shady hall into the bright sunlight they encountered taped-off roads and cars trying to find a way round the tremor hit zone. In one queue was a pink stretch limousine decked out in wedding ribbons - one couple were going to have a wedding day with a difference.